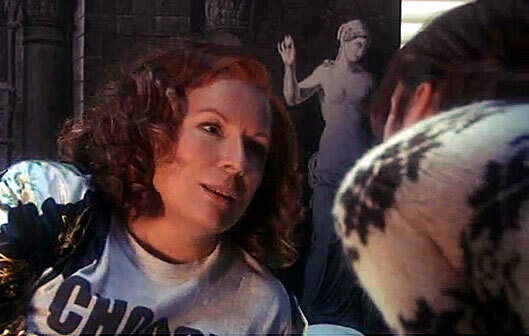 I wasn’t sure if I was going to write about the three new Absolutely Fabulous specials individually, or just wait until I’d seen them all and then summarise… but last night’s episode featured such an exciting cameo, I couldn’t contain myself! A few weeks back, when the second series of The Killing (aka Forbrydelsen) was kicking off, I mentioned that Sofie Gråbøl would be popping up in one of the specials, but presumed that she would just be playing “herself” as an unsuspecting celebrity drawn into Eddy’s orbit, or spotted on the street while shopping. 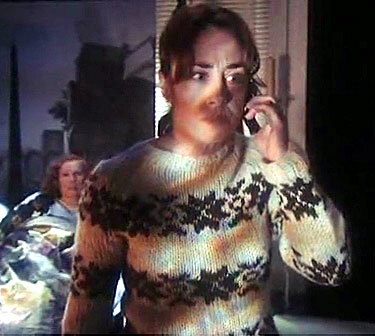 Instead, she appeared in character as ‘Sarah Lund’, during a dream sequence, berating Eddy for trying to pass off vaguely-accented gibberish as proper Danish… a joke that worked particularly well since Gråbøl speaks such perfect English! It was a bit of a shock to hear her actually… much like when characters in The Killing started randomly talking English, and my brain had to adjust: “Stop waiting for the subtitles, and just listen to the words, you fool!” It’s pretty clear from reading her interviews that Gråbøl has a great sense of humour, but she takes her most famous creation very seriously… so I’m glad she was such a good sport here, because it was a huge thrill to see two of my fave shows mashed together… heck, just seeing Lund wearing The Jumper again was a joy! All that aside, I thought this was a very funny episode… unsurprisingly the main cast aren’t quite as manic as they were when the show first started twenty years ago (lordy, I’m old! ), but there were still some great lines, and a lot of funny business to enjoy… and watching Bubble try to swallow the contents of a shaken champagne bottle was comedy gold! So far, it looks like the reunion was well worth the effort and the hype… even if it does make my “Absolutely Everything” boxset hopelessly passé! This entry was posted in Rants about TV and tagged AbFab, Absolutely Fabulous, Forbrydelsen, Sarah Lund, Sofie Gråbøl, The Killing. Bookmark the permalink.